Presentation Folder with full Ceremony Script and Keepsake Order of Ceremony – a lasting reminder of your special day! For additional information on our wedding ceremony services, please see our FAQ page. Elopement/legalization of marriage ceremonies are also one of the services we provide. A short pre-set religious or non-religious ceremony will be performed as well as all legalities in accordance with Marriage Act of Ontario. This service is available for the parties to be married and a small group of up to 10 guests. This package is available every day except Saturdays from May to November. The couple is responsible for providing a valid Ontario marriage licence for the legal marriage to take place. For legal document signing only, please contact us. We can also provide witnesses at $25 each which is paid directly to the witnesses. Looking for additional professionals to complement your wedding day? Please see our list of superior professionals we can highly recommend. The couple will write love letters to each other before the wedding which they will seal in an envelope. They will choose their favourite bottle of wine or drink of choice and place these and any other memorabilia in the wine box. If clients choose this ceremony option during the wedding ceremony, they will seal the box and vow not to open the box until an anniversary of their choice. The only other time that the box can be unsealed is when they are having thoughts of separating at which time they will drink the wine and read the letters which will hopefully remind them why they fell in love and chose to be together in the first place. Price include a bottle of your choice of red or white wine and a wooden decorative keepsake wine box. The original meaning of “tying the knot”. Usually known as a Celtic tradition although it also has origins in other cultures and countries. The hands are tied with different types of fabric including ribbons/cloth /braid/tartan to symbolize the bringing together of the two hearts and families in a marriage of strength and unity forever. 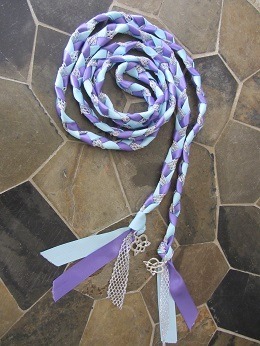 Price includes a custom made handfasting braid and a keepsake box. Can include a family tartan (or two). Tartan can be in wool or sateen – a quote for the imported tartan will be provided in advance. 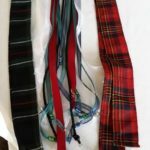 The photo to the right shows materials used for a recent two tartan handfasting with coordinating organza ribbons, beads and a cord. The photo to the left is one of our custom made handfasting braids. For additional information on handfasting, please see our blog post at All About Handfasting and our handfasting page with additional information and photos. As well, we also have premium handmade handfasting braids available for purchase and are accepting orders for custom made braids to suit you and your wedding ceremony. Please contact us for additional information and pricing. The Unity Sand Ceremony is ideal for any wedding. This ceremony option symbolizes the joining of the couple. The sand is used to symbolize the uniting of the couple. Their separate lives are represented by two vials of sand (usually different colours). The couple come together after the exchange of vows, and pour the two individual vials of sand into one into one vase. The flow of the sand symbolizes the joining of the couple as they share their first experience of unity as a married couple. In addition, this ritual is used when there are young children involved and the couple are looking for a ritual to involve the children, and additional vials of coloured sand can be used. The unity vase is then a keepsake of your wedding day. Price includes two vials of sand and keepsake glass container with lid. This ritual has long been used in Catholic weddings, but as a traditional ceremony option it also holds a universal meaning. It symbolises the joining of the couple in marriage as well as the joining of their two original families. The couple’s mothers can light their individual candles for them as a symbol to show that they are moving on from their family to create a new family together. Price includes two lighting candles, pillar candle and holder to keep. The Breaking of the Glass Ceremony is traditionally used at Jewish weddings; this ceremony option signifies the end of the ceremony and the time of celebration. As a health & safety concern, the glass must be stemless and is placed in a cloth bag prior to breaking. Price includes all materials. In the Wine Ceremony the couple can either choose to pour one white glass and one red glass to create a blush that they will both drink from or there can be a pouring of one glass that they both will drink from. Includes small bottles of wine and keepsake wine glasses. The Broom Jumping Ceremony does not originate with African Americans but is rooted centuries before in the British Isles and in particular, Wales, at a time when ordinary people could not marry. 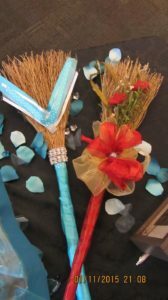 It symbolizes the clearing away of negativity with a sweep of the broom creating a threshold for the couple to cross over into their new life together. Hence, a bride was “carried over the threshold” (the broom laid across the front door opening of their home) to signify marriage. As the couple were not legally married, they therefore had a “broomstick marriage” or were “living over the brush”, a phrase that is still used in Great Britain today. It must be ensured that the couple can manage to safely jump over the broom to avoid accidents, otherwise stepping over the broom would be an option. Includes decorated birch broom to keep. The photo to the right shows two recent brooms decorated very differently. In the Rose ceremony the couple can choose to present roses to the mothers / grandmothers as a way of showing appreciation for their support. The roses can also be presented as the first gifts that the couple will give to each other. Includes fresh roses for both mothers/step-moms and grandmothers. There are many additional choices available including ring warming, rock ceremonies, time capsule, and balloon release (see also Involve your guests in your wedding ceremony)- to name a few. Ask us for details. A reasonable travel fee is added for ceremonies outside our wide service area. Please ask for pricing to your venue. At cost if overnight stay required. As set out in our FAQs section, after your ceremony and as a keepsake, a copy of your ceremony in a presentation folder can be provided, upon request, for a fee of $50 (except the Celebrant Ceremony where a presentation copy is already included in the ceremony package). $100 non-refundable deposit due at the time of booking to confirm your booking. We regret that until the ceremony is confirmed with a deposit, your date and time remains available to other couples.